Government-organised rally against ISIS killing ends in chaos. Could this be the beginning of the Ethiopian Spring? CLASHES broke out at a government-organised demonstration in Addis Ababa against the beheading and shooting of 30 Ethiopian Christian asylum seekers by Islamic State (ISIS) militants in Libya. The demonstrators hurled stones and scuffled with police during a rally by thousands in the capital today 22 April, after a video showed dozens of compatriots being shot and beheaded by masked jihadists. One protester who said he was a university professor said many in the crowd were angry that jobless Ethiopians still felt they had to travel to places like Libya in the hope of crossing over to a better life in Europe. Ethiopia’s government dismisses accusations from rights groups that it stifles critics and opponents. 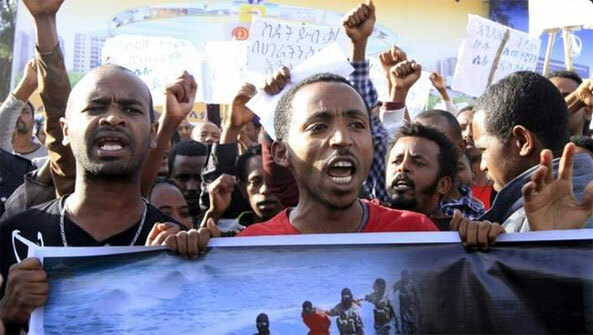 The march was arranged to show solidarity with the families of those killed but scuffles erupted moments after Prime Minister Hailemariam Desalegn spoke. The government blamed the opposition for hijacking the march and fired tear gas canisters at the gathering in Meskel square. Several of the demonstrators were rounded up, beaten and many arrested as police sought to break up the rally. Ethiopia has confirmed that those killed in the video were its citizens and family members have so far identified two of them. The prime minister urged Ethiopians not to travel across the Sahara to reach Europe. “We should strengthen our resolve against any form of terrorism and extremism,” he added in his speech. Could this be the beginning of the Ethiopian Spring? * Reuters and IBT contributed to the story.